Played without much realization of what will be to come. 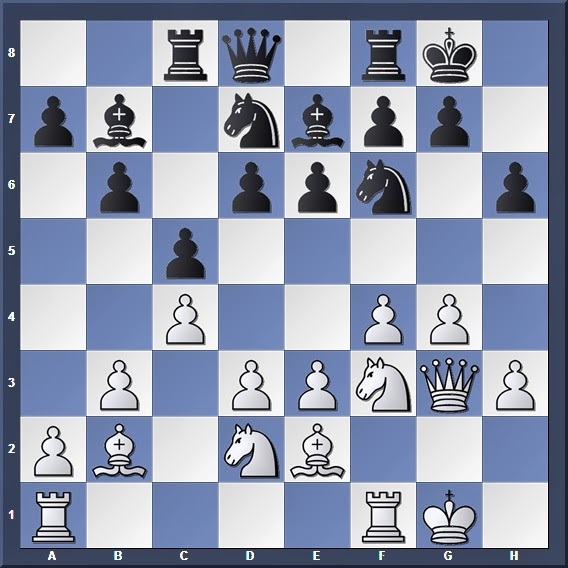 In several of my earlier games I had played the Old Queen's Indian with much success against irregular openings, much thanks to the solid and flexible nature of the pawn structure. 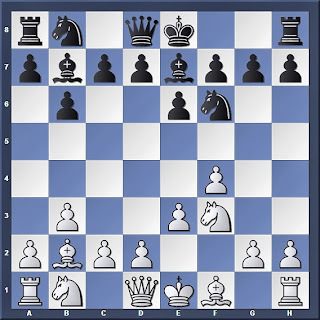 However, I had yet to test it against a strong kingside attack, which will soon turn out to be the critical test of the setup. To hit g3, gaining a tempo. My opponent had plans for the kingside, so of course he did not want this. Here he comes. The activity of his kingside pieces, coupled with both the upcoming pawn avalanche and HIS fianchettoed bishop on b2, is more than enough to let me know that a major assault is upcoming. 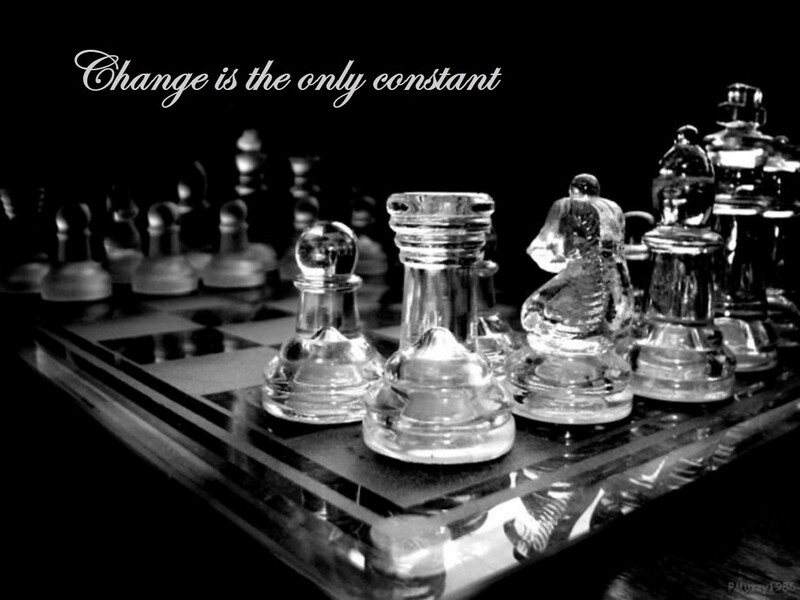 When defending, the best strategy will be to exchange off the opponent's pieces to weaken the force of his attack. The b2 bishop was the best target here since it was hovering over the vulnerable g7 square. Now after some helpful analysis by Fritz, I feel that a much better option for me would have been to launch the pawn break immediately with 17... f5! After the variation 18. g5 (18. e5 dxe5 19. fxe5 f4 20. 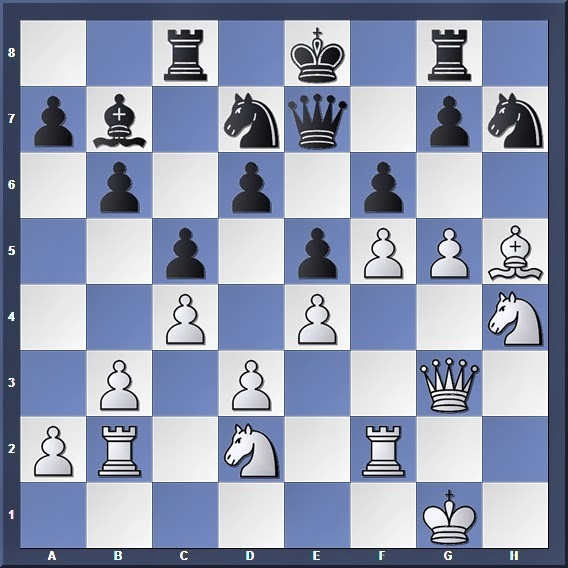 Qf2 leads to the same consequences, while 18. exf5 exf5 19. gxf5 Qf6 also helps to free my b7 bishop and bring my pieces over to the kingside quickly) 18... hxg5 19. fxg5 f4 White's attack is blunted. 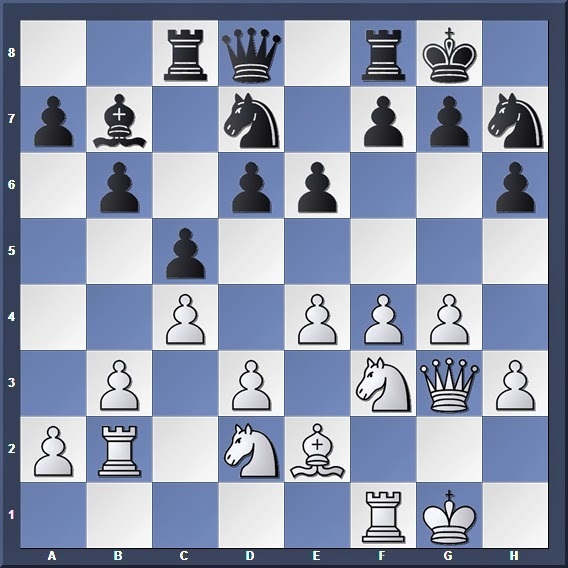 Although I still have the problem of trying to free my b7 bishop (which is still being hemmed in by the e5 pawn), at least my position is much less cramped than the one after the text move. 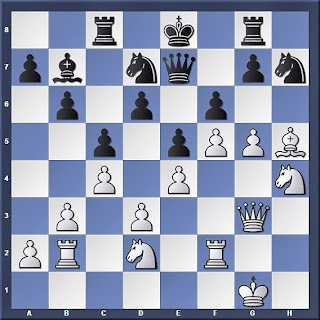 20. fxe5 dxe5 removes the momentum from White's pawn avalanche. Only except that I am a piece down. 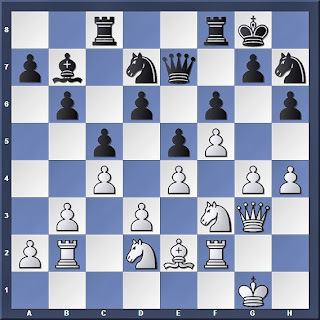 Look over to the fianchettoed bishop on b7-- I had placed it there in the opening without much thought of the fate that would befall it, and now one can tell that it has been literally cut off from the main action by White's pawn chain in the centre. To free it would cost several tempi (and moving lots of blocking pieces out of the way), which by then White would probably already have broken through. Thus with the fianchettoed bishop sitting there and unable to participate in the defense of the kingside, I am as good as a piece down. I could not just sit there and watch White overrun my position-- when the command post is under fire His Majesty must evacuate to a safer place. 22... fxg5 23. Rh2 Rh8 24. Rxh7 Rxh7 25. Nxg5 Kg8 26. Nxh7 Kxh7 was the better alternative, but my bishop is still a prisoner on b7. I stopped recording here; as the game continued I actually managed to evacuate my king successfully to the Queenside, but by then White had already broken through with his "extra piece" and won material. As such, let this game be a reminder to self and everyone here that a fianchettoed bishop is not always an advantage. While it can prove to be a strong attacker when in control of the long diagonal, it can also become easily cut-off from the game, especially when the centre is closed.